Review date: 20 November 2001. If you're shopping for a set of amplified computer speakers - which you probably want to plug into an actual computer, but which you might want to use with your game console, portable stereo, synthesiser or what-have-you - there are certainly plenty of choices. 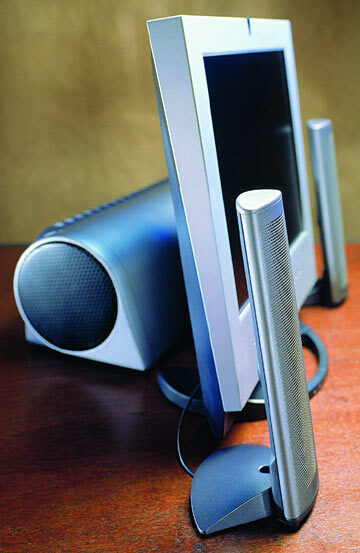 Even if you stick to the bigger brands, there are dozens of two, three and five speaker systems available. Two speaker systems don't have much bass unless the speakers are a lot more substantial than is usual for computer audio, but they're cheap. Three speaker rigs have two small satellite speakers and one bigger subwoofer; you can park the sub somewhere out of the way, and the satellites take up no more desk space than a two-speaker set. Five speaker setups are the same, but they've got two more satellites, for surround sound. If you're happy to buy yum cha off-brand speakers - which may be an excellent bargain, or may be dead on arrival, depending on the maker, the model, and the phase of the moon - there are dozens more options. Into this jam-packed market come TDK, with their Tremor three-piece speaker sets. The S150 model is the top-of-the-line Tremor. 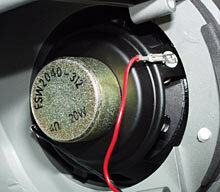 The "150" in the S150's name stands for the peak power output the system's meant to be able to manage - 150 watts. Peak power output figures, often referred to as Peak Music Power Output or PMPO, are a bunch of completely unstandardised, meaningless lies used to sell all kinds of low-power audio gear. But if you make such gear and you don't quote peak numbers, people who do will poach your business. So everybody makes up a number to put in the PMPO box. 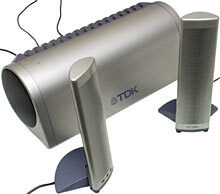 TDK also, fortunately, quote the RMS power output for the S150 on their page for it, and they say it's 75 watts. A mere factor-of-two exaggeration of power output for the peak number is actually rather modest, and a three-piece sub-sat system with a genuine 75 watt output and half-decent sensitivity (the amount of noise you get for a given input power) should be more than adequate. Power ratings aren't actually all that important, anyway; thanks to the logarithmic response of the human ear to sound pressure levels, a hundred watts only sounds four times louder than one watt, all other things being equal. The 75 watts comes out of this item. It's about 405mm long by 145mm high by 180mm deep (16 by 5.7 by 7.1 inches), it's quite weighty for its size, and it's got one speaker at each end. 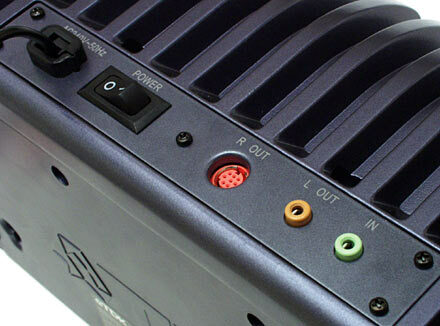 Like most three-way system subwoofers, the S150 subwoofer contains all of the power electronics, and it's the thing that you plug into the wall. The ribbed back of the subwoofer is cast aluminium, not plastic, which accounts for a lot of the weight and makes the 75 watt specification plausible. 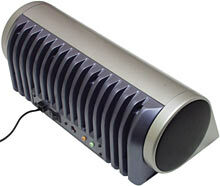 You need a decent-sized heat sink for a 75 watt amplifier, and this sub definitely has one. With one three inch driver at each end, this "Force Pipe" sub is alleged to have somewhat better bass performance than the single-driver subs in the lower-spec Tremor systems. They're tubular subs too, but there's a driver at one end and a port at the other. Their quoted bass limit is 60Hz, versus 50Hz for the S150 sub. Sure this thing can do 50Hz. Suuuuuuure it can. We'll get back to that shortly. On the back of the sub, there's a plain 1/8th inch stereo jack for input, another one for the left satellite speaker output, and a mini-DIN plug for the right satellite speaker. 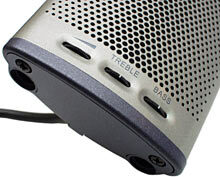 The right satellite contains the volume, treble and bass controls. The only control on the subwoofer is the power switch. That's inconvenient if you want to stow the sub somewhere out of reach. Fortunately, the Tremor system goes into standby mode when it receives no signal for a few minutes, then wakes up again when the signal returns. But there's still no simple way to quickly mute the speakers, if the sound source you're using doesn't let you do it there. More on the sub in a moment. It's the satellite speakers in this kit that are the really unusual things. The Tremor satellites are thin. Really thin. If you've got an LCD monitor, like unto the one in this TDK press handout picture, then these are definitely the speakers to match. The speaker bodies - which can be attached to the desk stand shown here or to included self-adhesive monitor/wall mounts - are about 250mm high (10 inches). But they're only about 70mm wide (2.75 inches), and a mere 29mm deep (1.15 inches), without their stands. You can make a speaker this small using ordinary voice-coil-and-cone transducers; a stack of four baby-transistor-radio two inch drivers would do it. But such a speaker would sound very tinny unless you gave them massive bass boost, and doing that would leave you with miserable maximum volume. The Tremor satellites manage decent volume and a pretty wide frequency response - the crossover point between the sub and the satellites is quoted as 180Hz, which is a bit higher than normal but not amazing - because they don't use ordinary drivers. They use flat panels. 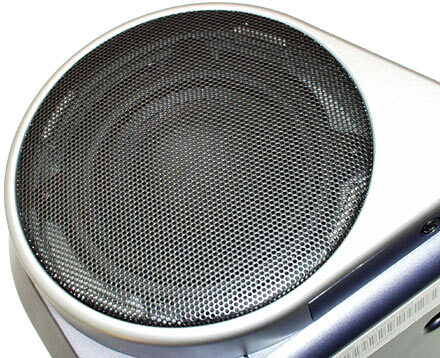 Flat panel speakers are becoming quite popular for computer audio, and in other situations where conventional big rectangular speaker boxes aren't desirable. There are a number of thin and flat speaker designs, but the kind we're talking about here are a relatively recent flavour. They're known as "bending wave" drivers. Normal speakers act like pistons, pushing and pulling directly at the air with the cone (or dome) attached to their voice coil. Bending wave drivers use a panel made of stiff card (various panel materials are possible), which is driven by one or more an "exciters". A bending wave panel exciter may or may not use the same basic technology as a normal speaker's motor (a coil inside a magnet), but it'll definitely have much smaller "throw" - it won't move nearly as far. Like, half a millimetre, at most. 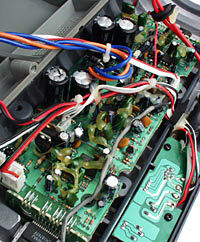 The exciter's firmly mounted to the panel, and thus causes it to vibrate. These small but rapid vibrations, not unlike the vibrations in a violin body that's been similarly "excited" by the vibration of a string, are what make the sound. It's the bending of the panel that makes the noise, not any gross fore-and-aft motion. The biggest name in the flat panel mass market, and the creator of the most peculiar sub-variety of bending wave speaker, is UK company NXT. NXT's an offshoot of Verity Group, which in turn is the multi-brand that grew out of Wharfedale. NXT's "Distributed Mode Loudspeaker" (DML) technology is licensed out to various manufacturers, and it's different from other bending wave speakers. They use a central exciter that creates panel vibrations not unlike the concentric ripples from a rock dropped into a pond. But a DML panel resonates in a disordered, chaotic way, with sound emitted wherever the various vibrations reinforce each other sufficiently. This ought not to work - when NXT first announced the technology, some people called it a hoax. But, against all reason, it does. The DML approach means that none of the panel's own resonances are able to significantly influence the sound it emits. Instead, the sound that radiates from both sides of the panel closely resembles the signal going to the exciter. I couldn't get the Tremor satellites apart to have a close look at the panel without damaging them, since they've been glued together. But from peering through the grille at the back I could see that the exciter's mounted half way up the panel and slightly to one side, and the panel has asymmetrically placed weights on its lower half, giving that portion of it a lower resonant frequency. I could get the sub apart, though. So I did. The subwoofer's aluminium back panel is firmly screwed onto the plastic moulding that makes up the rest of the sub, and there's a proper sealing gasket in between. The electronics package on the aluminium panel, and the large power transformer on the sub's base, both stick into the air space between the two drivers. If this were a vented box, that might matter (though the box designs of most of these little subs are pretty rough and ready). This is just a sealed box, though, so all the protruding internal components do is reduce the air volume inside the sub. Sealed box speakers, all things being equal, have more bass the more volume they have. This box is maybe 15 litres with a following wind, which ain't much for a pair of three inch drivers. How do you keep the components on a circuit board inside a subwoofer from vibrating their solder joints loose? Well, if you're TDK, you try drizzling hot melt glue over them like honey on porridge. Hey, it can't hurt. Here's one of the two amplifier chips at the ends of the main circuit board, firmly screwed onto the heat sink panel. This is a National LM1876TF dual 20 watt stereo power amp. Two amp chips good for 40 watts apiece make a 75 watt all-up rating for the amp hardware reasonable enough. These amp chips have a "quiet fade-in/out mute mode" built in, which is less poetically known as "de-thump". Many cheap sub/sat systems don't have de-thump, and so like to tell the world when you turn them on; the S150 doesn't make any noise for a couple of seconds after turn-on. The two drivers in the sub each hide behind a token square of polyester wadding, which in quantity would give you more bass but less loudness, but in this amount doesn't do much more than stop the speaker wires from buzzing on things. The speakers are, as you'd expect, entirely unremarkable fairly-long-throw paper-cone shielded-magnet pressed-metal-frame off-brand cheapo-drivers. They probably can actually handle the 20 watts that the printing on the back suggests, but their small magnet assemblies (shielding is pretty bulky; most of the lump on the back of this driver isn't useful magnet) indicate that their efficiency won't be terrific. Setting up the S150 kit is easy. The connectors are colour-coded, and there aren't many of them. Want digital input, four-speaker output, even a headphone socket on a satellite? Forget it. Just plug in the power lead and your stereo input, connect the satellites (which have cables of generous length), and you're away. 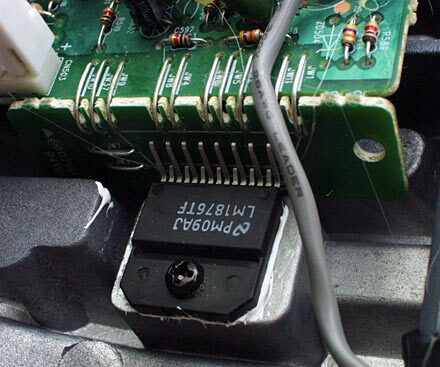 There aren't even spring-terminal speaker connectors, which is a good thing if you ask me; far too many people manage to wire one or both satellite speakers backwards when they're presented with spring terminals. One speaker backwards will severely mess up your stereo image; two speakers backwards will give you weird cancellation effects in the mid-bass frequency range where both satellites and subwoofer are playing. Somebody at TDK presumably thought it was a great idea to use these very small inset wheels for the controls on the right-side satellite. I can't quite follow their reasoning. The wheels are awkward and fiddly, and it's hard to turn one without holding the speaker still with your other hand. They look pretty spiffy, though. Bass-wise, the TDK kit's adequate. There are lots of three-piece speaker sets with a sub with about as much box volume as the S150; few if any of them have as much amp hardware power (or anything like as big an amplifier heat sink), most only use one driver, and many have nasty case resonance issues. On the other hand, the single driver in most of the S150's competition is usually bigger than the drivers in the TDK kit. It'll be at least a four inch, and possibly five or six. Only in the specialised world of teeny-speakers are three inch drivers even regarded as woofers. Multiple smaller drivers can do the job of a single larger one, but little three inchers still have some serious response limit issues. When I pumped away at a bass groove on my keyboard, the TDK sub more or less kept up. I was fairly impressed. But then I turned on my main amp, connected to a couple of completely undistinguished sealed-box speakers with 15 inch bass drivers and real response down to 60Hz. That reminded me that there is, unquestionably, a difference between baby-subs and proper bass drivers. It was partly the sound that reminded me. And it was partly the dead moths being shaken out of the light fitting. Hooking the S150 sub up to the audio frequency generator revealed that it does, indeed, have some response at 50Hz - but it's much quieter at that pitch than it is at 100Hz, and clearly well below the minus three decibel (-3dB) point of its sensitivity graph. The -3dB point is the generally accepted limit you use when you're quoting the real frequency response of a speaker. A 3dB volume difference is a factor-of-two difference in the actual audio power of a sound, but the way human ears respond to sound means that you need a 10dB difference, which is a factor-of-ten power difference, to perceive a doubling or halving of volume. A 3dB volume difference is, canonically, the smallest clearly audible volume step. So using those points in a speaker's response plot - the points where its output is 3dB quieter than its average - as the upper and lower limits of its response is a fair way of describing what it can do. It is, however, common for makers of small speakers to shamelessly quote response down to -6dB, -10dB or whatever. Yes, their product does make sound even when it's 20dB down. But unless you've got your own tone generator connected to the speaker and it's outputting just that frequency, there's no way you're going to be able to hear it over the other frequencies in the input. TDK's fibbing about the S150 sub's response is standard operating procedure for multimedia speaker makers. Even ones that make more serious speakers which they specify honestly. Take Klipsch, for instance. They make serious home and professional audio gear, but they also make computer speakers, and Klipsch play just as fast and loose with the specs of their PC products as TDK. They claim 31Hz bass response from their sub-$US200 Promedia 2.1 three speaker setup, for example. That has a subwoofer with a single 6.5 inch driver and a small ported cabinet that weighs a bit more than seven kilograms. I bet it does have significantly better bass response than the S150 sub, but it utterly does not manage 31Hz at any significant volume. Very few speakers do. For comparison, Klipsch also still make the huge, legendary "DC to daylight" Klipschorn speakers. The design of these giants hasn't changed much since they were originally created in 1948, and so arguments about whether they're horrible old fossils or time-tested classics have been in progress since before the Beatles got together. But nobody contests the Klipschorn's awesome, Biblical, floorboard-loosening bass. You can get subwoofers with better bass response than a Klipschorn, but few full-range speakers, even today, can match them. Klipschorns weigh 75 kilograms each. They contain a monster 15 inch bass driver at the end of a high-efficiency folded horn that needs the cabinet to be pushed into a room corner for it to work properly. They cost around $US5000 a pair. Play organ music on them and you'll loosen your teeth. But their (entirely genuine) -3dB bass response limit is a mere 35Hz. 4Hz higher than the alleged bass response of the Promedia sub. Ten of which weigh less than one Klipschorn. So take multimedia speaker bass figures with a grain of salt of about the same size as your head, OK? In the treble department, the NXT drivers in the Tremor kit do quite well. They're significantly superior to the dirt cheap paper-cone widerange drivers you'll find in really cheap satellite speakers. And the peculiar characteristics of the flat panel drivers may suit you better than ordinary boxy speakers, even if you don't need super-slim satellites. One characteristic bending wave speakers have which very few other designs can manage is that they're reasonably close to being a spherical sound source. Ordinary speakers emit a quite directional "beam" of sound; if they emit significant energy from any other face of their box and don't have actual specific drivers there for the purpose, that energy will probably be out of phase with the front wave, and that'll cause interference and cancellation problems. Flat panels emit pretty much the same waveform from both sides, with just a quite small cancellation field around the edge. This means that flat panels display surprisingly little change in audio characteristics with distance and direction. Their location and which way they're pointing isn't very obvious from their sound, and everybody in the room hears the sound at much the same volume. The little S150 satellites don't display this effect as dramatically as bigger, higher power models, but it's still there. The relatively uniform sound radiation from these speakers leads to one of the big marketing claims for NXT technology. That is that these speakers have no "sweet spot" - no small area where the listener has to be in order to get a really good stereo illusion, with a point-to-the-instruments soundstage. This is true enough, but the flipside of it is that there isn't any place you can sit in the sound field from these flat panel speakers in which you'll get as clear a stereo image as you can get from good conventional speakers that've been set up well. The more enthusiastic marketers make a positive out of this, by saying that the speakers don't have no sweet spot, but in fact have a huge one. There's a large area in which they sound their best, the place where speakers sound their best is the sweet spot, ta-dah. Well, OK, fine. But there's still no sharp-stereo listening location. Bending wave flat panels just don't ever sound as "sweet", in this sense, as conventional "point source" speakers. Because of this, some people describe the sound from bending wave panels as "unclear" or "muddy". Don't take that to mean that it's muffled. It's not. The S150 satellites have decent frequency balance and perfectly good highs, at least by multimedia speaker standards. But if you're looking for a pin-sharp soundstage, you're not going to get it. If you're an audiophile hunting the perfect sound, you're (a) not in the market for little computer speakers in the first place and (b) likely to write off bending wave drivers altogether. But the sweet spot issue isn't really a problem for computer speaker setups, anyway. Or, indeed, for the majority of music and home theatre systems. Computer speaker systems aren't generally used for "critical listening". And most people just aren't "critical", in the audiophile sense. You may well listen to music while you use your computer, but the music isn't likely to be your primary focus at the time. And while sound effects in games can be exceedingly high tech these days, with positional audio technology to give you a convincing illusion of height, width and depth, no speakers can do as good a job for that as headphones anyway. Speakers can't avoid letting the left ear hear stuff that was meant for the right, and vice versa, no matter what technology they use. Home audio systems are also only seldom up to audiophile standards. Even if you've got quite expensive, high quality speakers, did you spend time playing with their proximity to walls, their exact heading, the height of their stands (if any), the treatment of the surfaces in the room, the position of the furniture in the room, your listening position(s), and the system's audio spectrum equalisation? If you didn't at least fiddle with the speaker positioning - and most people just drop 'em on the floor or shove 'em into a bookshelf and have done with it - then any "sweet spot" the system has will be there only by coincidence, and you probably won't be sitting in it anyway. Heck, a ton of people use little mini- or midi-systems whose speakers may or may not be utter rubbish by audiophile standards, but which definitely won't provide a great listening experience when they're jammed hard up against the sides of the component stack, only a couple of feet apart from each other. But that's where the speakers are often put, and that's where they often stay, and the owners of the resulting only-barely-stereo system don't generally seem to mind. 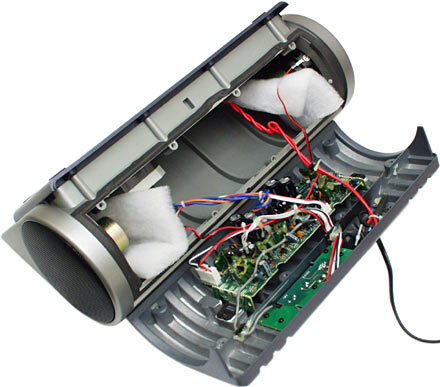 Lots of people are also perfectly happy with "airy" speaker systems made to fill an area with sound, like Bose's Lifestyle systems for instance. There's no way to set up one of these rigs to provide what a hi-fi purist would describe as a sweet spot; at no point can they fairly be described as truly high fidelity. But if you find they way they sound (and look) pleasing, then what's the problem? Add to this the fact that a large amount of popular music has been recorded on multiple microphones and thoroughly cooked by the producers, and thus has no real soundstage anyway, and the whole sweet spot issue becomes a bit ridiculous. More practically, the S150 rig manages OK but not amazing volume. The satellites use normal voice coil exciter technology and have roughly five ohm DC resistance, and they're about as loud at a given input level as some plain eight ohm cone-driver computer speakers I also had sitting around. So their efficiency isn't marvellous, but it'll do, and they're decently balanced with the sub. If you're listening to something with a lot of bass (or just wind the little bass control all the way up) then it's easy to get the sub to produce obnoxious distortion noises, and this little speaker set isn't what you want if you're looking for output too loud to talk over. But for the purposes for which it's designed, it's fine. If this were the only $AU249 three piece PC speaker system in the world, it'd be a perfectly good deal. Unfortunately for TDK, the S150 has plenty of competition, and most of the competition gives you knobs that're easier to operate, and possibly also extras like headphone sockets and easily accessible power and/or mute buttons. As far as plain audio performance goes, the S150's quite good for the money. Its real -3dB bass limit is probably somewhere in the 70 to 80Hz range, if not higher. But that's par for the course in this market segment. At least the sub doesn't have a huge peak in its bass response, like the little bandpass boxes many other small sub-sat systems use. They sound bassy, but that's just because they're really good at buzzing away at, say, 65Hz, regardless of what bass note's actually meant to be playing. The Tremor sub's hefty heat sink and neat design definitely count in its favour, the satellites look great, and the system's price isn't ridiculous. So it's worth checking out. But check out what else you can get for the money, too.